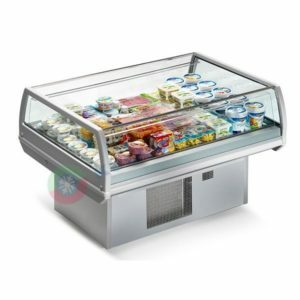 Refrigerated cabinet available only in ventilated version, ideal for the display of packed products, such as milk products, sausages, etc. It can be placed on any surface place, considering its dimensions and use. Equipped with frame with castors, built-in unit, display surface in stainless steel AISI 304, control panel with digital thermostat and automatic defrost, with electric evaporation of defrost water. Front curved tempered glass.